It’s been few weeks since we started featuring GOQii Users success stories. These are stories of players who have reached their goals both in terms of clocking the required and more no. of steps, reaching their health goals, inspiring others to get healthy as well as doing well by donating their Karma Points. Anurag Bisen, 48, has conquered all of these aspects! Here is his success story, in his own words. I am Anurag Bisen, a serving naval officer. Not that I was not active. I was active as I used to play Squash, go Yachting etc but, it was not a regulated regime for exercising. I did it all in spurts. Then I took to running sometime in March 2014 thinking every day running will become regular. But, yet again I was not happy about the way I was going about it. Then one day I was relaxing reading a tech magazine. I follow technology very closely and I came across an article about GOQii. I found it extremely interesting to read about this new wearable from an Indian company and decided to find out more. Once, I got to know about GOQii I decided to go in for the band and became one of the beta players of GOQii on April 25, 2014. Since then I have had a fantastic experience with GOQii and my coach Shimpli Patil. We initially discussed by issues and my goals. My coach in her own way kept me motivated to regulate my daily routine. My health goal initially was to reduce my weight. I was 98 kgs. Back then. I was very active and fit in my 20s and then somewhere I was unable to maintain a regulated regime. But, after getting on to the GOQii ecosystem I was determined to make a change. I was clear I had to do much more in a more disciplined manner. I made it a point to run regularly five days a week and on weekends played Golf as that was my rest day. But I clocked more steps on weekends as well. And because I do not run on weekends I run double the amount on Monday. The change for me seemed like I have resurfaced again and all thanks to my coach for that. Tuesday to Friday- I walk 4 km in the morning and run 6 km in the evenings. Monday I run double the amount as I do not run over the weekends. On an average I run 70 km a week. My weight reduced from 98 to 83 in just 11 months and I have been maintaining that. Once my activity routine was regulated and I had started running enough, in 2014, GOQii put together teams to do the 100 km Oxfam Trailwalker. I have been interested in hiking and trekking and also indulged in these activities quite a bit. But, I had never walked 100 kms. And the best part we had to finish this 100 km Trailwalk within 48 hours. GOQii interestingly also has a Karma initiative wherein based on your daily step count you earn karma points. These points can then be donated to charity that GOQii has partnered. Currently, it has a partnership with Oxfam and the points I earned I have donated part of those points to an Oxfam cause. This is a great initiative as one gets healthy and also does good for the society to make a difference in others life. My experience in the first year of Oxfam Trailwalker was good. As a team though we could not finish. But, I was determined to complete the walk. All the steps that I’d accumulated up to this point clearly paid off. My training plan worked perfectly; I felt strong. So I took off on my own after my 3 teammates backed out. Technically our team was out but, I wanted to finish the 100 kms for my own self. GOQii team was there to motivate and that was good. I completed the 100 kms and I was in cloud 9. Second year that is Nov 2105, I participated again in the trailwaker and this time we were four school mates who came together to walk 100 kms for charity. It was a sort of reunion for us. We had a memorable time walking together. It was completely overwhelming. Overall, I can say that GOQii has made me extremely active and fit. I do not have any particular restrictions on food. I pretty much eat everything I want to. But, I am controlled. Sometimes I have my cheat days over the weekends when I indulge a bit. But, then I make sure I burn all those calories with a good run. GOQii is a great concept and I am sure it can make a big change in people. Another fact I like about GOQii is the connect it has with its consumers. In my mind I have set a target to earn a set amount of Karma points. Once I have earned those many points I shall donate them to charity. To anyone who thinks they cannot or do not have it in them what it takes to do something like walking a 100 km or just about waking every morning and going for a 4 km walk or a 6 km run, just remember: all you need to do is take that first step. Put, one foot in front of the other. Keep it up. Before you know it, you’ll arrive. 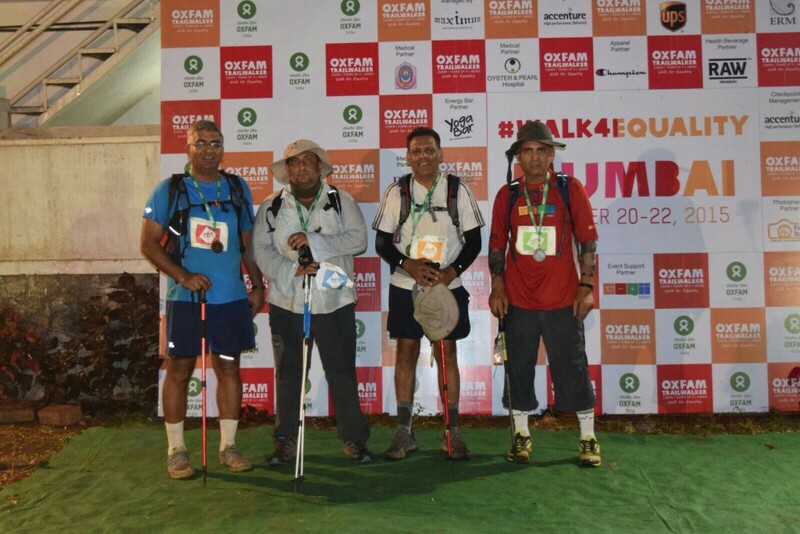 Anurag with his 3 schoolmates after completing the 100 km Oxfam Trailwalk in Nov 2015. What does his coach Shimpli have to say? Anurag has been on the GOQii platform right since the beta phase. Being from the Indian Navy, he has always had a disciplined lifestyle. But, he felt there was something amiss. His aim was to make his workouts more regular and lose some weight (fat) and we kick started the GOQii journey with these ambitious goals. During the course of Coaching, I was extremely astounded to see the way Anurag was progressing towards his goals. There were hardly any days where Anurag’s step count did not hit the target that we had set for him. It was very clear that this was easily achievable only because of Anurag’s infinite dedication, super strong willpower and the staggering amount of energy that he possesses. Anurag was so driven towards his goals that he could not resist going out for a run even when he was travelling or felt under the weather. One thing that just kept him going was his deep-rooted PASSION! 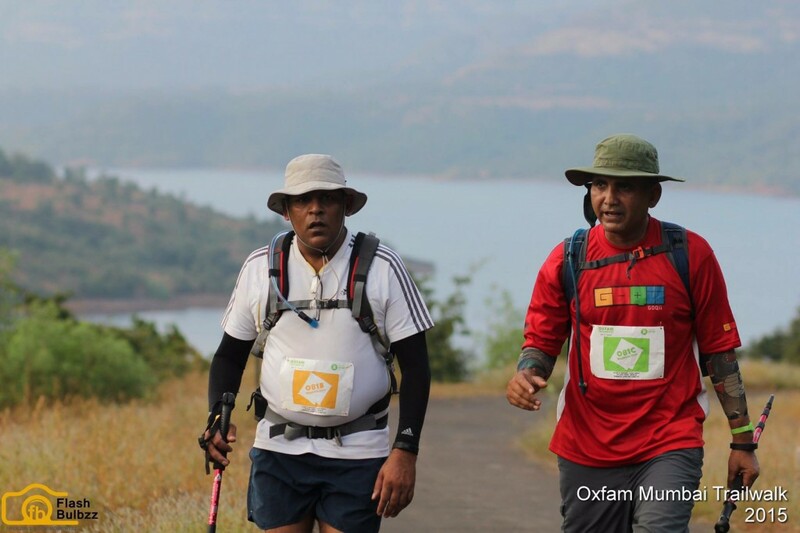 With a passion like his, Anurag not only completed a couple of Marathons but also successfully completed the 100 km Oxfam Mumbai Trailwalker twice in the two consecutive years! Anurag is indeed an inspiration to many! With his dedicated endeavor, he has managed to put his workouts in place and has come down from 98 kg to 83 kg today, with a very prominent reduction in the belly fat!